Though Shuto “Shuton” Moriya is known for his play as Pikmin protagonist Captain Olimar, he has a backup character, or pocket pick, in Shulk. During a tense match with Dacota “Ryuga” James in the winner’s bracket of the 2GG Fire Emblem Saga tournament, Moriya was failing to find success with his main against James, and found himself facing a 2-0 score against him. In danger of getting swept and on match point, Moriya busted out Shulk and bounced back to move on to the next round. The visible sigh of relief, as Moriya staved off elimination for one more game, turned into a rout, as James was having trouble adapting to the new character. A Corrin main, James had an impressive run into the top 48, most notably upsetting top-level Smash pro “Larry Lurr” Holland. But Shulk isn’t a very common pick. The Xenoblade Chronicles character comes in at D tier on Smashboards’ rankings, and even disregarding tiers, it’s rare to see a Shulk compared to characters like Bayonetta, Cloud, Diddy Kong, or even Corrin. 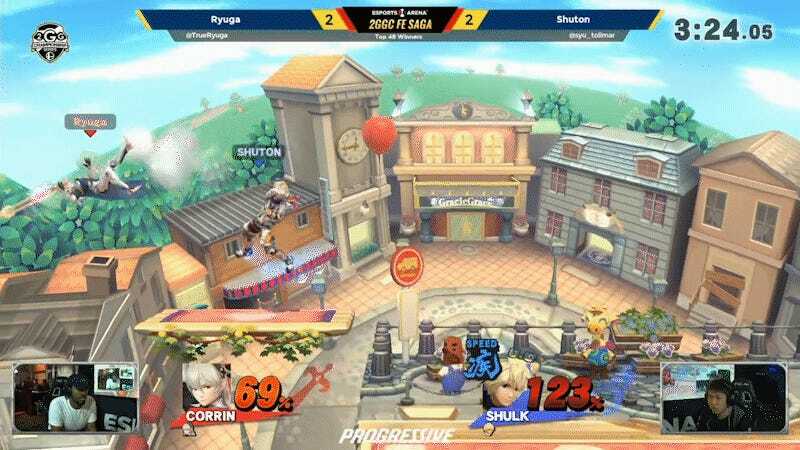 With the right mixture of talent and surprise, a pocket pick like Shulk can be—and was—devastating. In a final game, James looked like he had started to gain solid footing, but Moriya’s Shulk capitalized at the best possible moments, turning the tide in a split-second. A dive off the platform at the end of the game capped off the series, as Moriya reverse-swept James and advanced. James would later be eliminated by Tyrant in a 3-2 set, while Moriya is currently in a run through the loser’s side after a loss to Manny Medina. If you want to catch the whole set, you can find the Twitch VOD here, while the rest of Fire Emblem Saga plays out tonight on 2GG’s Twitch channel.